Archaelogical finds indicate that Florida had been inhabited for many thousands of years prior to any European settlements. Spaniards first arrived in 1513 and lay claim to a large, imprecisely defined area extending from about modern day Gainesville northward to the Carolinas, which they called La terra florida, "The flowery land". Over the following century, the Spanish and French both established settlements in Florida, with varying degrees of success. 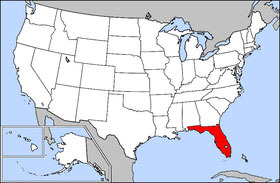 The area of Florida diminished with the establishment of British colonies to the north and French colonies to the west. Control of parts of Florida passed among Spanish, British, and American control. Spain finally ceded Florida to the United States with the Adams-On�s Treaty in 1819, in exchange for the US renouncing any claims on Texas. On March 3, 1845, Florida became the 27th state of the United States of America. Today, Florida is the fourth most populous state in the Union. Though Florida has traditionally been a Democratic state, in recent years explosive population growth has brought with it many Republicans, leaving the state approximately evenly split between the two parties. Although the Republicans control the governorship and most other statewide elected offices, both houses of the state legislature, and 18 of the state's 25 seats in the US House, Democrats control the state's two Senate seats, and the presidential contest in Florida in 2000 was extremely close. As such, and because of its high population and large number of electoral votes, Florida is considered by political analysts to be a key swing state in Presidential elections. In Miami, the liberal Democrats vie for control with wealthy Cuban right wing Republicans and their business allies. Tampa was once a hotbed of Democratic union support, but has reversed polarity completely in recent years, and is now governed by heavily pro-business Republicans. Outside of liberal Miami-Dade County, the Florida Democratic Party tends to be socially conservative and heavily associated with the good ol' boy network. Florida consists of a panhandle extending along the northern Gulf of Mexico and a large peninsula with the Atlantic Ocean as its eastern border and the Gulf of Mexico as its western border. It is bordered on the north by the states of Georgia and Alabama. It is near the countries of the Caribbean, particularly the Bahamas, Cuba, and Haiti. Florida's economy is heavily based on tourism. Warm weather most of the year and many miles of pristine beaches provide a thriving vacation spot for travelers from around the world. The large Walt Disney World theme park and resort complex, located near Orlando, drives the economy of that area, along with more recent entries into the theme park arena such as the Universal Orlando Resort. The great amount of sales tax revenue is what allows the state to be one of the few to not levy a personal income tax. Other major industries include citrus fruit and juice production, banking, and phosphate mining. With the arrival of the space program at Kennedy Space Center in the 1960s, Florida has attracted a large number of aerospace and military industries to the state. Florida does not have any state minimum wage laws. Florida's public school revenue per student and spending per $1000 of personal income usually ranks in the bottom 25% of U.S. states. Average teacher salaries rank near the middle of U.S. states. Florida public schools have consistently ranked in the bottom 25% of many national surveys and average test score rankings. It should be noted that many education surveys are not scientific, but do measure prestige. Governor Jeb Bush has been criticized by many Florida educators for a program that penalizes underperforming schools (as indicated by standardized tests, such as the FCAT) with fewer funding dollars. Major testing organizations frequently discount the use of state average test score rankings, or any average of scaled scores, as a valid metric. In 2000, Governor Bush and the state legislature acted to abolish the Board of Regents that governed the State University System of Florida. Instead, each public university is now controlled by its own Board of Trustees who are directly appointed by the governor. As is typical of executive-appointed government boards, the appointees so far have been overwhelmingly Republican. This has not been without controversy. In 2002, Democratic Senator Bob Graham started a ballot referendum designed to revert to the Board of Regents system.